Whispers in the Loggia: "Suitable Magnificence" – In New York, The Universal Pastor At "The Nation's Church"
"Suitable Magnificence" – In New York, The Universal Pastor At "The Nation's Church"
And now, in the place the Vatican's long held to be the "Capital of the World," this PopeTrip's second leg begins. 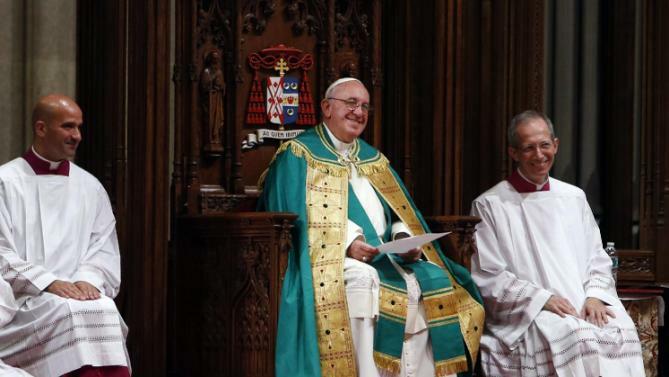 Having arrived in New York at 5pm Eastern time, Francis heads to St Patrick's Cathedral – freshly unveiled after a years-long, $175 million restoration – for Vespers at 6.45 (worship aid), with the clergy and religious of the 2.5 million-member archdiocese (the US second-largest) forming the bulk of the congregation. “There is a cause for rejoicing here”, although “you may for a time have to suffer the distress of many trials” (1 Pet 1:6). These words of the Apostle remind us of something essential. Our vocation is to be lived in joy. This beautiful Cathedral of Saint Patrick, built up over many years through the sacrifices of many men and women, can serve as a symbol of the work of generations of American priests and religious, and lay faithful who helped build up the Church in the United States. In the field of education alone, how many priests and religious in this country played a central role, assisting parents in handing on to their children the food that nourishes them for life! Many did so at the cost of extraordinary sacrifice and with heroic charity. I think for example of Saint Elizabeth Ann Seton, who founded the first free Catholic school for girls in America, or Saint John Neumann, the founder of the first system of Catholic education in the United States. This evening, my brothers and sisters, I have come to join you in prayer that our vocations will continue to build up the great edifice of God’s Kingdom in this country. I know that, as a presbyterate in the midst of God’s people, you suffered greatly in the not distant past by having to bear the shame of some of your brothers who harmed and scandalized the Church in the most vulnerable of her members... In the words of the Book of Revelation, I know well that you “have come forth from the great tribulation” (Rev 7:14). I accompany you at this time of pain and difficulty, and I thank God for your faithful service to his people. In the hope of helping you to persevere on the path of fidelity to Jesus Christ, I would like to offer two brief reflections. The first concerns the spirit of gratitude. The joy of men and women who love God attracts others to him; priests and religious are called to find and radiate lasting satisfaction in their vocation. Joy springs from a grateful heart. Truly, we have received much, so many graces, so many blessings, and we rejoice in this. It will do us good to think back on our lives with the grace of remembrance. Remembrance of when we were first called, remembrance of the road travelled, remembrance of graces received... and, above all, remembrance of our encounter with Jesus Christ so often along the way. Remembrance of the amazement which our encounter with Jesus Christ awakens in our hearts. To seek the grace of remembrance so as to grow in the spirit of gratitude. Perhaps we need to ask ourselves: are we good at counting our blessings? A second area is the spirit of hard work. A grateful heart is spontaneously impelled to serve the Lord and to find expression in a life of commitment to our work. Once we come to realize how much God has given us, a life of self-sacrifice, of working for him and for others, becomes a privileged way of responding to his great love. Yet, if we are honest, we know how easily this spirit of generous self-sacrifice can be dampened. There are a couple of ways that this can happen; both are examples of that “spiritual worldliness” which weakens our commitment to serve and diminishes the wonder of our first encounter with Christ. Another danger comes when we become jealous of our free time, when we think that surrounding ourselves with worldly comforts will help us serve better. The problem with this reasoning is that it can blunt the power of God’s daily call to conversion, to encounter with him. Slowly but surely, it diminishes our spirit of sacrifice, renunciation and hard work. It also alienates people who suffer material poverty and are forced to make greater sacrifices than ourselves. Rest is needed, as are moments of leisure and self-enrichment, but we need to learn how to rest in a way that deepens our desire to serve with generosity. Closeness to the poor, the refugee, the immigrant, the sick, the exploited, the elderly living alone, prisoners and all God’s other poor, will teach us a different way of resting, one which is more Christian and generous. Gratitude and hard work: these are two pillars of the spiritual life which I have wanted to share with you this evening. I thank you for prayers and work, and the daily sacrifices you make in the various areas of your apostolate. Many of these are known only to God, but they bear rich fruit for the life of the Church. In a special way I would like to express my esteem and gratitude to the religious women of the United States. What would the Church be without you? Women of strength, fighters, with that spirit of courage which puts you in the front lines in the proclamation of the Gospel. To you, religious women, sisters and mothers of this people, I wish to say “thank you”, a big thank you... and to tell you that I love you very much. I know that many of you are in the front lines in meeting the challenges of adapting to an evolving pastoral landscape. Whatever difficulties and trials you face, I ask you, like Saint Peter, to be at peace and to respond to them as Christ did: he thanked the Father, took up his cross and looked forward! Dear brothers and sisters, in a few moments we will sing the Magnificat. Let us commend to Our Lady the work we have been entrusted to do; let us join her in thanking God for the great things he has done, and for the great things he will continue to do in us and in those whom we have the privilege to serve.